OK, I admit, I am on a soup kick lately. I love that I can make soup ahead of time and then re-heat it later for dinner or for lunch throughout the week. Soup is just so uncomplicated, pure and so darn easy to make. Once you make a homemade soup, you will never go back to the canned variety. I’ve been trying to eat seasonally and take advantage of all these amazing vegetables that are available right now. While I was at the market the other day, I noticed these beautiful, enormous, organic red bell peppers. 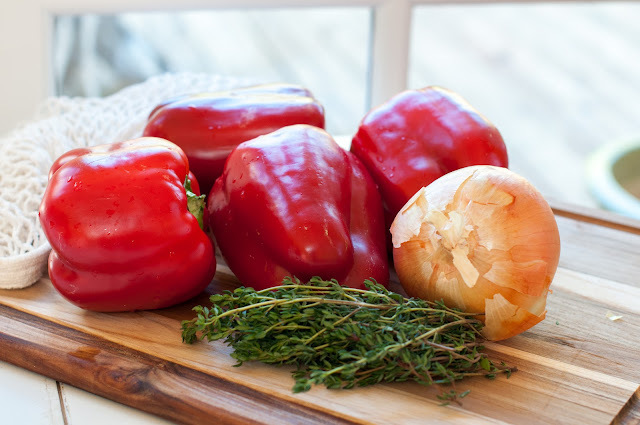 We love red bell peppers raw, but have never tried them in a soup, so I was ready to experiment. I’m so glad that I did because this soup was amazing. It’s silky in texture and tastes honestly like roasted red peppers, hence the name. Preheat your oven to 450 degrees. Wash the peppers and then cut them in half lengthwise. Cut the stem off with a pairing knife and scoop out all the seeds and membranes using either a spoon or melon baller. Place the peppers cut side down on a rimmed baking sheet that has been lined with foil, use parchment paper, see my note below. Update: I just learned this tidbit at natural chef school! Don’t use aluminum foil for cooking. Cooking your meat or veggies directly on aluminum foil leaches aluminum into your food, so it’s a big NO, NO! Simple solution, use parchment paper instead! Roast peppers in pre-heated 450 degree oven for about 25 minutes, or until the skins are completely wrinkled and the peppers are charred, rotating the sheet if necessary for them to cook evenly. Below is what mine looked like after 25 minutes. 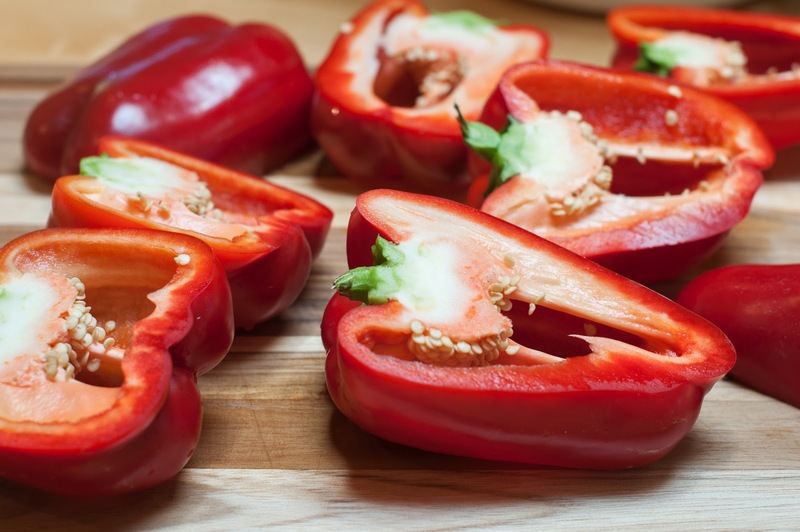 Let peppers cool for a minute or two, and then remove them from the baking sheet, place them in a bowl, cover bowl with foil or a plate, and let them cool for about 30 minutes. 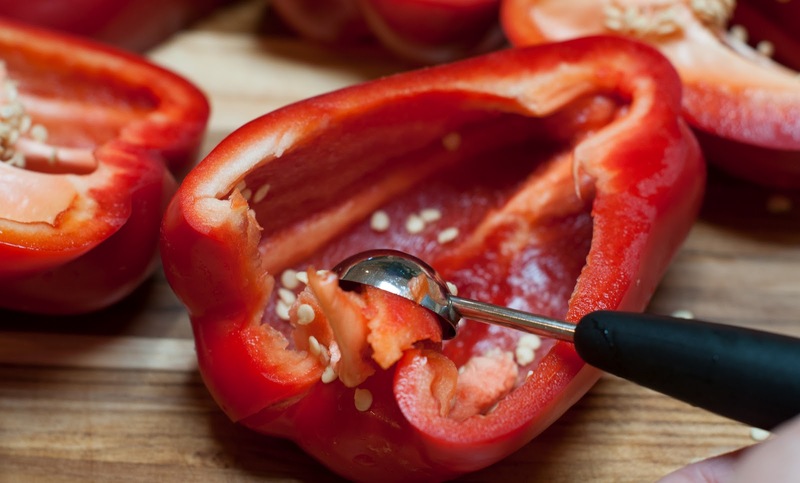 When the peppers are cool enough to handle, peel off the skins and discard them, drop the peeled peppers back into the bowl. In a large saucepan or Dutch oven, heat olive oil or ghee over medium-high heat. Add in the onion and sauté for about 5 minutes, or until soft. Add the garlic and cook for another minute. Add in the thyme leaves, tomatoes with their juice, chicken or vegetable stock and bring to a simmer. 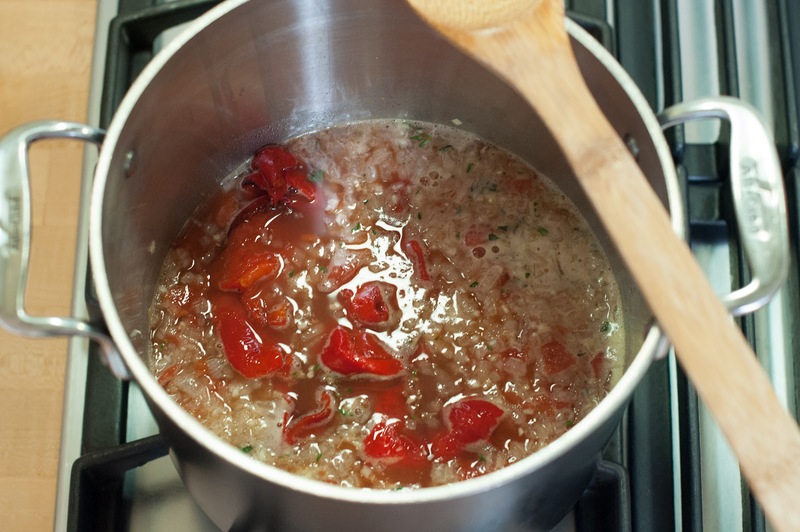 Add the red peppers along with any juices that have accumulated in the bowl. Turn down the heat to medium-low and cook uncovered for about 20 minutes. Make sure to stir the soup every so often. After the soup has cooked for 20 minutes, add in the sour cream and salt and pepper to taste. The soup is going to look a bit curdled until you puree it. 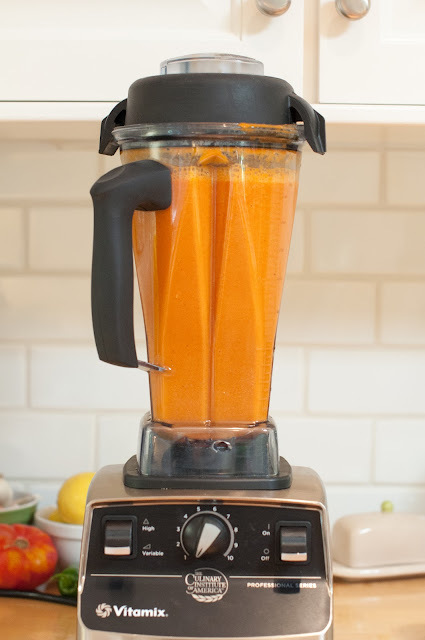 Puree with either a hand-held immersion blender or transfer soup to a blender and pulse until smooth. 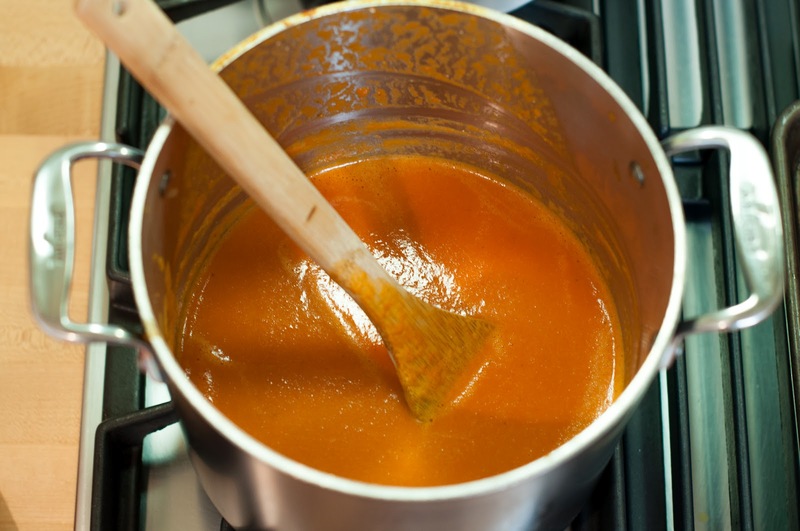 If you’re using a blender to puree the soup, make sure to wipe out the pot before adding back the soup. Turn the heat to low and heat the soup through. 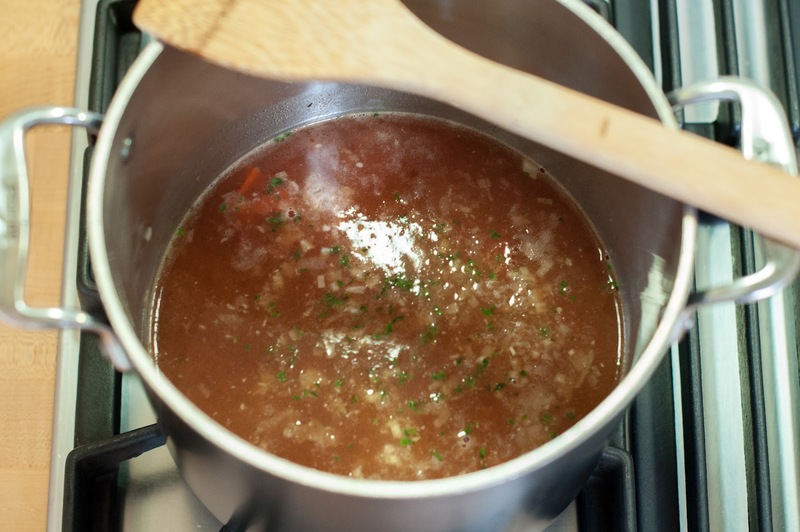 Give the soup a taste and adjust the seasoning if needed, serve warm. Serve the soup up with some popovers, crusty bread or some warmed nann bread. Enjoy! Wash the peppers and then cut them in half lengthwise. Cut the stem off with a pairing knife and scoop out all the seeds and membranes using either a spoon or melon baller. 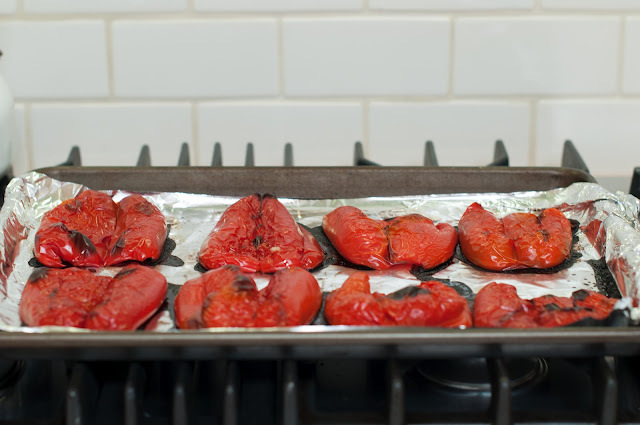 Place the peppers cut side down on the prepared baking sheet. 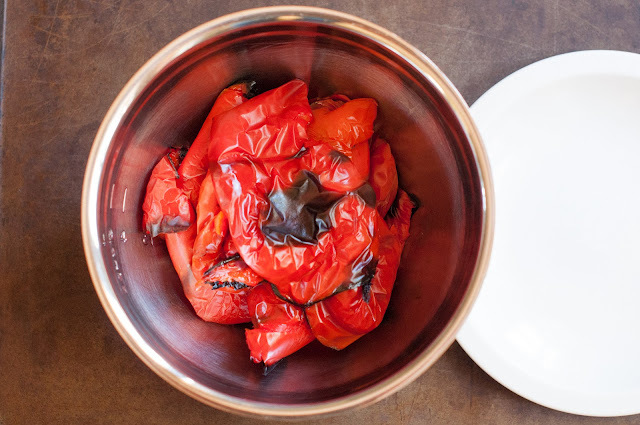 Roast peppers in pre-heated 450 degree oven for about 25 minutes or until the skins are completely wrinkled and the peppers are charred, rotating the sheet if necessary for them to cook evenly. Let peppers cool for a minute or two, and then remove them from the baking sheet, place them in a bowl, cover bowl with foil or a plate, and let them cool for about 30 minutes. 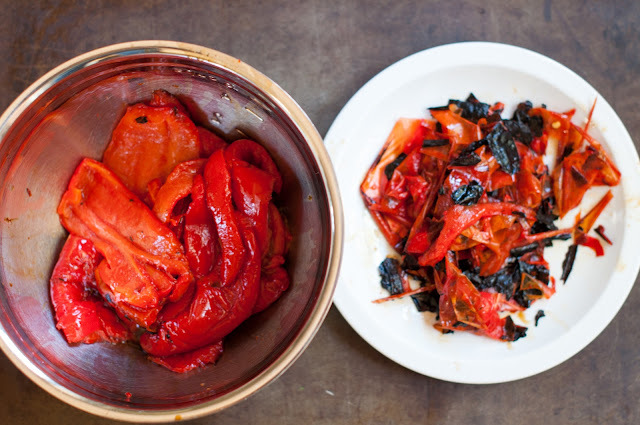 When peppers are cool enough to handle, peel off the skins and discard them. Drop peeled peppers back into bowl. In a large saucepan or Dutch oven, heat olive oil or ghee over medium-high heat. Add in the onion and sauté for 5 minutes, or until soft. Add in the thyme leaves, tomatoes with their juice, and chicken or vegetable stock and bring to a simmer. 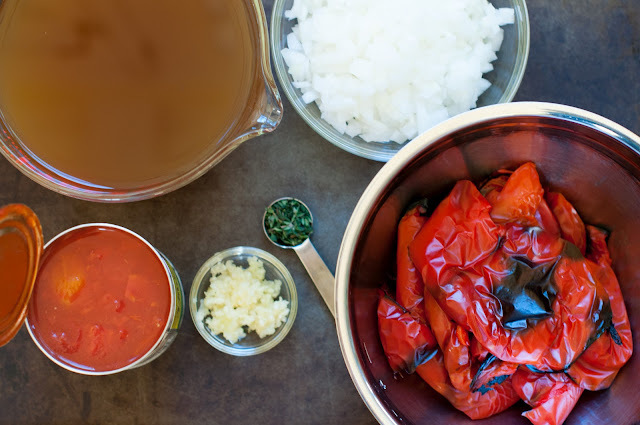 Add the red peppers along with any juices that have accumulated in the bowl. Turn down the heat to medium-low and cook uncovered for about 20 minutes, making sure to stir the soup every so often. After the soup has cooked for 20 minutes, add in the sour cream and season with a salt and pepper to taste. Note: The soup is going to look a bit curdled until you puree it. Puree soup with either a blender or a hand-held immersion blender until smooth. 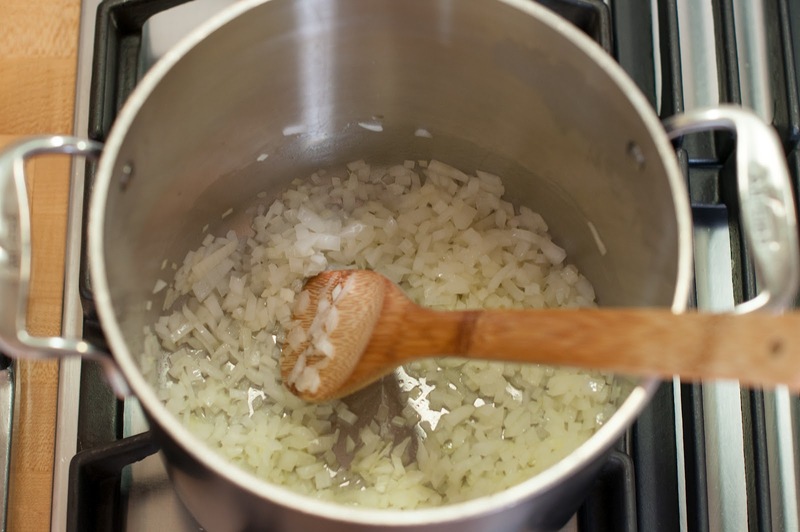 If you're using a blender to puree the soup, make sure to wipe out the pot before adding back the soup. Turn the heat to low, and heat the soup through. Give the soup a taste and adjust the seasoning if needed. how many does this soup serve or qts does it make. I’m thinking about pressure canning it. Cornbread, now that sounds yummy. I may try that next time. The color is great, and I think I would love it with corn bread! This looks delicious! Love the idea of serving it with a popover!